Whether you perform professional welding work or do welding tasks as a hobby, it is important for you to get a quality welding helmet. You should know that not all welding helmets are made with the use of the highest standards. It should be your goal, therefore, to look for a helmet that is durable enough so that you can use it for a long time. You must also make sure to purchase one that can carefully shield your neck, eyes, face and head from the infrared light, sparks, UV light, flash burn and heat to avoid being hurt or harmed by the effects of these elements. It is also crucial to note that apart from getting a quality welding headgear, you must see to it that the helmet suits your needs perfectly. When you do so, it can provide you with a maximum level of comfort, enhance the weld quality and boost your productivity. That is why you have to select very wisely from among the many different welding helmets that you see online or on the market. Moreover, you have to remember that it is highly beneficial for you to pick out a helmet that meets the ANSI Z87+ standards since you can rest assured that it has passed the required standards that can guarantee your safety while you are doing the welding work. There are actually certain things that you should check out when shopping for the perfect welding helmet for you. It is to your great advantage to take note of these things very carefully. Decide on the type of welding helmet. 1 Decide on the type of welding helmet. 3 Check out its adjust-ability feature. 4 Determine its power source. 5 Consider its delay controls. 6 Find out about its sensitivity control. 7 Check how many sensors it has. 8 Examine its lens reaction time. 9 Know its viewing size. 10 Choose the shade carefully. You can select either the auto-darkening welding headgear or the passive welding headgear (also called the standard welding helmet). There are pros and cons to using each helmet type. You must consider their pros and cons well so that you can make your best choice. Speaking of auto-darkening welding headgears, they are more advanced than the passive types and are also light reactive. Their cons include the following: they are powered by batteries to work; they have a tendency to malfunction when you do not know how to handle them properly; their sensors can wear out and stop working through the passage of time; and they cost more because of their high technology and high-grade materials. Their pros include the following: they are great for short welds and track welding; they help prevent risks of contracting injury, neck fatigue or any discomfort; and they make it easier for the welders to see without taking off their helmets every now and then, plus the welders can do their welding work with much ease. Speaking of passive welding headgears, they are the traditional helmets used for welding. They are used by many and are popular. Their cons include the following: their viewing lens does not provide a clear vision for the welders, so they are not excellent for short welds or track welding; they can cause stress to the neck or neck fatigue when used over a long period of time because the welders have to flip the helmets from time to time while working; and they are not highly recommended for novice welders as the welders cannot easily position the gun or electrode with the use of such helmets, which can result in defective welding. Their pros include the following: their cost is lower than the auto-darkening helmets since the material used for making them only consist of low-cost molded plastics; they provide protection at a price that you can afford, so you can still get a helmet even with a low budget; and their lenses are made of dark-tinted glass to provide protection to your eyes. It goes without saying that using a heavy helmet will certainly produce a feeling of discomfort not only on your neck but also on your shoulders, especially after working for a long period of time. You may not feel the discomfort at first after performing several short welds, but you will experience neck fatigue after welding for hours on end when you use a heavy helmet. It is to your great advantage to use a 1-pound welding helmet instead of a 2-pound welding helmet. Moreover, try to select a helmet that has multiple bands so that the total weight of the welding helmet is distributed evenly to all bands, which will cause the helmet to feel lighter once it is worn. Check out its adjust-ability feature. You definitely need a helmet that feels comfortable on your head. That is why you have to make certain that you can adjust the helmet easily either back, front, down or up. It should not feel too loose or too tight on your head. You must be able to tighten it with ease. Do not pick out a helmet that quickly falls off the moment you bend since this means that it does not suit you perfectly at all. RELATED POST: Miller Welders vs. Lincoln Welders: Which Brand of TIG and MIG Welder Should You Choose? You may select between a solar-powered helmet and a battery-powered helmet. Solar-powered helmets need to be recharged under the sun once they stop functioning due to lack of power, so your work can be delayed in this situation. On the other hand, once the battery-powered helmets run out of battery, their batteries can be replaced right away, and you can still continue your work. Batteries come in two varieties such as the lithium battery and the AAA battery. The lithium battery can be used for a long time, but its replacement cost is high. The AAA battery has a short run time, but its replacement cost is low. The delay control feature is a vital aspect in a welding helmet that you must consider. This feature makes it possible for the welder to set the duration of the lens of the helmet to stay dark even after the completion of the welding arc. Short delay works best for track welding since this can speed up the work of the welder. Long delay is necessary for high amp welding to protect the welder against possible emissions of harmful radiations coming from molten metals until they cool down. Find out about its sensitivity control. Be sure to pick out a helmet that comes with an easy-to-adjust sensitivity control feature so that you can adjust the degree of brightness, which can influence the lens of the helmet to darken. This feature particularly works well for low amp welding. A good example of such kind of welding is the TIG welding where the arc has a lower degree of brightness than any other welding types. Check how many sensors it has. 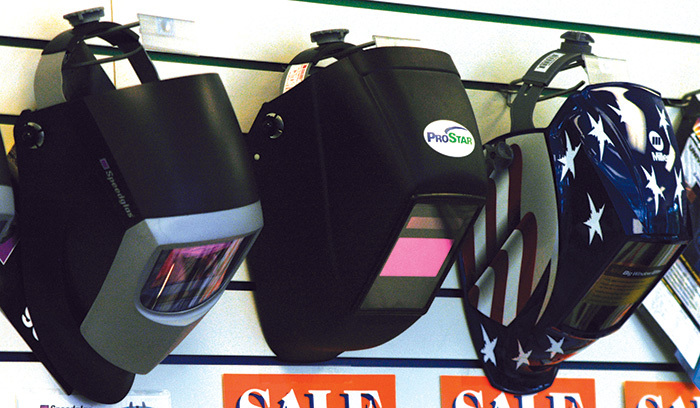 The number of a welding helmet’s sensors really matters a lot, depending on the degree of work to be done. They have something to do with the coverage of the welding work. When a helmet has more sensors, it provides better coverage. Usually, for welding work done by the hobbyists, two sensors will suffice. On the other hand, for welding work done by the professional industrial welders, four sensors will be necessary. Examine its lens reaction time. The reaction time of the lens usually refers to the time you have to wait until the lens of the helmet darkens. In other words, it is the time when the lens’ shade changes from no.3 or no.4 to no.8 or higher. This feature works in such a way that it diminishes the effects of IR and UV rays on the welder’s eyes, and prevents severe eye fatigue. The best choice would be to purchase a helmet that has a lens that has a high reaction time. Choose a helmet that makes it possible for the shade to change quickly and shield the welder’s eyes against the high-intensity light instantly as well. The reaction time that is applicable for industrial work processes is 1/20000 of 1 second. However, the reaction time that is suitable for entry-level welding work is 1/3600 of 1 second. If you do the welding work for hours on end, you can only avoid severe eye fatigue when you choose a helmet that can provide fast switching speeds. The viewing size should not be dismissed as this can either give you comfort or discomfort while welding. More often than not, the range of viewing size varies from one welder to another. However, you must take note that 9 sq. inch is recommended for industrial purposes, whereas 6 sq. inch is best for light duty welding applications. You can choose either the variable shade or the fixed shade. You can achieve shade 9 to shade 13 with the use of the variable shade option. If you normally modify the welding amperage and the arc’s brightness, and use various welding processes such as stick welding, TIG welding and MIG welding, variable shade is just perfect. On the contrary, you can achieve shade 10 when you use the fixed shade option. It usually works for a distinct welding process that has limits on amp range and which involves a similar material that has similar thickness.